Employees: This page is a current reference* to your HR questions. *This is solely provided for Informational/Professional use. 07/10/17: State & Federal Medical Marijuana Laws. Your reference source is here. Senate Republicans release Obamacare repeal bill. On questions that many could have on ACA here is link for reference on Q & A. A: The New Overtime (OT) rule should not change hourly rates of pay. You will most likely learn that OT will no more be allowed, or will be mostly restricted to very limited circumstances. However if you are salaried, the OT rule might bring a change in your job classification or description, with maybe its implications in your rate of pay. In any case, it will not reduce your pay. In the best case scenario, it will bump your salary level. It is really up to what policy your company is going to opt for. Q: A co-worker tells me that because I am over 65 the company cannot force me to keep my insurance. I do have Medicare but I pay x$ per paycheck for my insurance and I also pay for my Medicare. A: No employer can "force you" to enroll in employer-sponsored insurance: it is a benefit. You may opt out, especially if you are 65. Read about it here. As long as you are employed, your primary insurance will be your work-related one, and Medicare will be secondary. Evidently if you decline your "work" insurance, you will have Medicare as primary and can also get some Medicare supplement. Food for thought: your work insurance could provide more coverage (benefits) than Medicare. Make sure you weigh the pros and cons. Read more about Medicare enrollment here. Employers offer wellness programs also. It could be helpful if you have special needs. Read about wellness programs here and more here. You may read more about it here. And finally, read this to get a better insight on cost of healthcare during retirement. Beware: Medicare does not cover as much as you might think or expect. Q: Why is my premium less this year? What HSA means? Why HSA? A: Many employees see in less premium, less out of pocket money and bigger take home money. Beware that your company's health coverage might have changed a bit. The ACA has triggered many changes in health care benefits coverage. Employers are trying to offset the rising cost of healthcare. This article will help you understand better how it could unfold. Do you consider yourself passionate about HR? I care equally about business interests/results and people matters. It is an enjoyable "juggling" or balancing act. It keeps you engaged. Unfortunately, concerns often conflict and it puts HR on a rough spot; it is a consistent reminder of our vulnerabilities as humans and professionals, regardless of our field of work. It is also fair to say that among my other top interests are Fashion and Cooking. To me, both are synonymous of cultures in so many ways: both Fashion and Cooking/Cuisines tell you so much about a given society and/at a given time. It is a constant discovery, and stimulates creativity. It is also sharable. July 3rd, 2014Are you up to date? 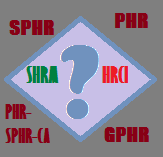 Have you visited the SHRM page on the whys of the new certification? Unveiled in Florida, at the latest SHRM National Conference, and awaiting accreditation. HR without frontiers.... The new face of HR? HR evolves, says SHRM. It evolves around People, Organizations, Workplaces and Strategies. Being a HR professional is not only about knowledge. It is also about competencies, says SHRM. Confusing? What is the definition of a professional? Here is Merriam-Webster's definition: "someone who does a job that requires special training, education, or skill : someone who is a member of a profession". I came across this article about what a true professional is. 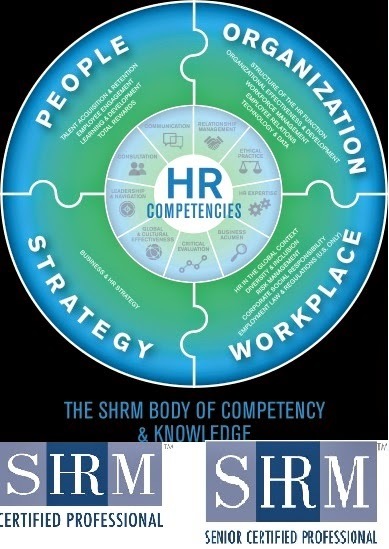 And here is how SHRM pictures HR competencies to us. However, "SHRM membership is not required to attain the new Certification"
The profession of HR comes in full circle...If you want to keep yourself tuned with the subject...click here. Let's Spring forward with March, the DD Awareness month, and dedicate a short time to a growing HR challenge: Healthcare and related matters. 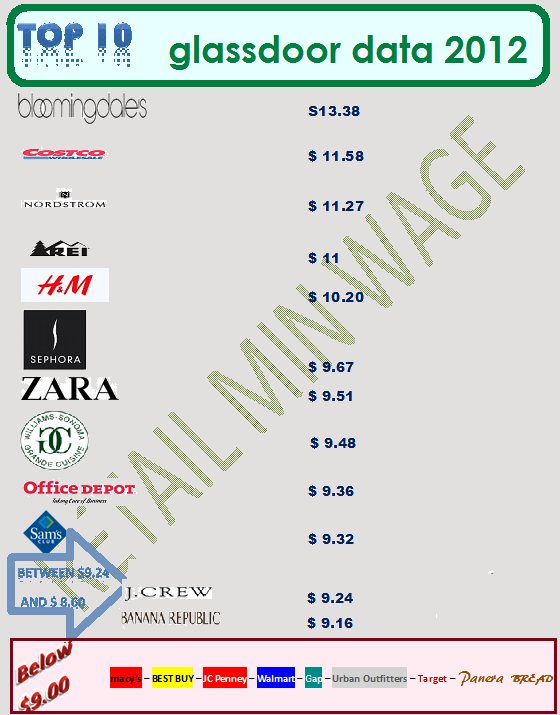 The minimum wage topic has been making the headlines lately. Aside from its impact on the economy in general, its linkage to engagement, productivity, and HR make the whole issue a sensible one. I am also convinced that there is a linkage between those elements and branding. The interesting fact is that no matter the philosophy of the company, no matter the policies, all will be reflected by, or through its managerial staff. So, first critical point is how the managerial team understands the policies and much more critical is how it understands and implements those policies. The level of engagement is measured by the gap between those two elements.The level of HR is somehow measured by the level of engagement. This explains the shift to storytelling. THERE is the story of HR success. Can - Do People Trust HR? All things considered, I doubt that HR hears the whole story. I am also convinced that leadership cannot hear all voices in places where no formal HR exists, such as in smaller organizations or units of larger ones. On the other hand, I highly doubt that leaders hear any story that does not resonate with them. Indeed, do YOU want to know? The questions remain: what resonates with leaders and do people trust HR? How much experience counts? To what extent does experience count? True, I have been silent for awhile, but here am I, reminding myself that from inadvertent chit chat to note trail, and let alone cyber security concerns, we need to remind ourselves that privacy is no matter of laugh or joke. It does matter, more than ever in HR, in these times where many businesses are struggling to find a balance between the need for HR presence and assumed better efficiency via automation. 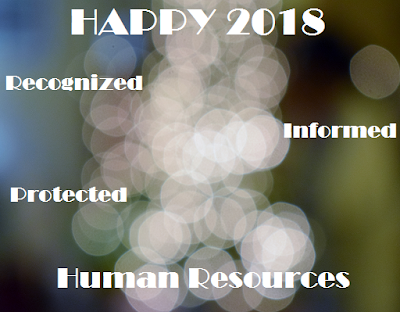 A few recent observations reminded me of how privacy is a constant work in progress, and that HR should stay heavily involved in the process, in training, information, communication, and enforcement. Ethics is no matter of joke or negligence: a timeless reference here. In flattened organizations however, the challenge is becoming a problem as all ends are loose in absence of HR. The strategic decision of eliminating HR is increasing HR_related risks. The situations can be simplistic but the risks are not that simple as it appears. Life teaches us lessons in leadership on a global and personal scale as well, and branding is closely linked to leadership, as much as branding relies on communication. Lights on leadership can be dimmed or brightened depending on how communication is managed. It has been a challenging year to say the least, with its heavy share of highs and lows. So what life lessons can we take on this season of lights?